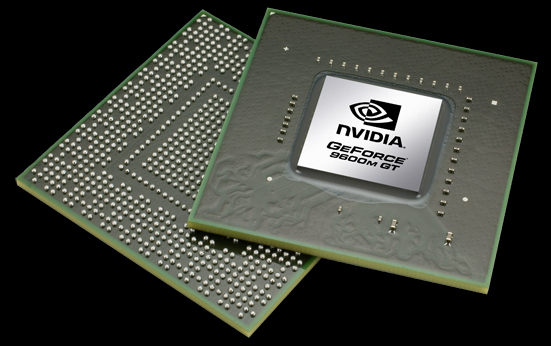 The Nvidia GeForce 9600M GT is a DirectX 10 graphics card for notebooks andsuccessor to the 8600M GT. Compared to the 8600M GT or 9500M GS, the 9600M GT was produced in 65nm (allows higher clock rates with the same current consumption) and features a new PureVideo HD video processor (VP3) and HybridPower support. In conjunction with the Nvidia 9100M G integrated graphics, the 9600M GT supports Hybrid-SLI (only HybridPower). HybridPower is a technique to choose between the integrated and dedicated graphics core, if performance or battery runtime is needed. This works only in Windows Vista. Up to now the user has to use a tool to switch between the GPUs. Later Nvidia wants to switch automatically in the drivers. GeForceBoost is not supported with this card, as there would be no performance gain. As the 8600M GT, the 9600M GT features 32 stream processors that do the graphic work of the vertex- and pixel-shaders. The performance of the 9600M GT should be somewhere between the 9500M GS and the 8700M GT (depends if GDDR2 or GDDR3 memory chips are used). Compared to desktop graphics cards, the 9600M GT is similar to the GeForce 9500GT (which also descends from the G96 core). The desktop CPU 9600 GT has a 256 bit memory bus and is therefore much faster. Features PCI-E 2.0, 400 MHz Speichertaktung bei GDDR2, 800 MHz bei GDDR3, PureVideo HD Technologie (VP3), Hybrid SLI mit HybridPower (mit aktuellen nVidia Chipsätzen). PCI-E 2.0, 1250 MHz Shader Taktung, 400 MHz Speichertaktung bei GDDR2, 800 MHz bei GDDR3, PureVideo HD Technologie (VP3), Hybrid SLI mit HybridPower (mit aktuellen nVidia Chipsätzen).